Veronica Forrest-Thomson was an innovative poet and literary theorist, whose work is only now beginning to attract the attention it merits. Her aesthetic is founded on engagements with the criticism of William Empson and the philosophy of Ludwig Wittgenstein, and develops through an early assimilation of structuralist and poststructuralist thought, including the seminal work of Roland Barthes, Julia Kristeva and Jacques Lacan. In her referentially rich poetry, Forrest-Thomson engages with the full range and history of poetry in English in her explorations of three themes: identity, the nature of experience, and the representation of both British and American contemporary poets, including those usually known as the language poets: North American writers who, since the 1970’s, have explored a related poetics. This study provides the first sustained consideration of Forrest-Thomson’s poetry, and of the relationships between her work and that of the language writers. 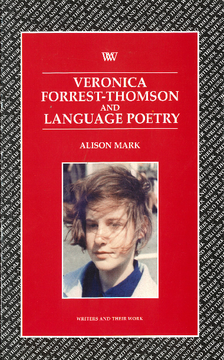 It all culminates in an overview of the project of Language writing and its important contribution to contemporary ‘avant-garde’, and shows that Forrest-Thomson’s body of work, both poetry and poetics, deserves to be considered as one of the most remarkable achievements of the late twentieth century. Alison Mark is the Senior Lecturer in English at the University of Luton. Before this she taught at Birkbeck College, London and Brunel University. As well as being the author of a range of articles on literary and cultural subjects she co-edited Contemporary Women’s Poetry: Reading/Writing/Practice (2000).